ATU has not expanded its Job Action beyond Work To Rule and A Ban On Overtime. ATU has not suggested anyone book sick to intentionally disrupt service. Our operators are human and it is currently cold and flu season, our operators are exposed to higher than normal amounts of people in a confined area for extended periods and they get sick it happens. If an operator is sick they have the ability under the collective agreement to book sick and get themselves healthy. It’s time to end this dispute! We need a vibrant transit service that will continue to attract people to use the system and rely on it as a viable method of transportation. However, ongoing labour disputes have affected everyone including our members who provide this service. 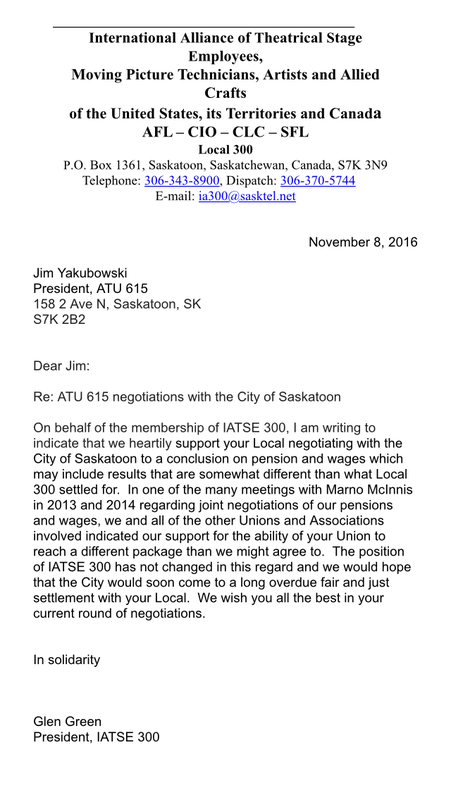 ATU 615 has always stated that we will handle negotiations in a way that will have the smallest impact on the citizens of Saskatoon and union members. Over the past four years, we’ve done that to the best of our ability. However, given the city’s inflexible stance, we have no other alternative but to take job action by way of work-to-rule and a ban on overtime. There is a solution: third party arbitration. We believe our differences can be resolved by calling on a non-partisan panel to determine if the city has the legal right to make changes to our pension plan without our consent. Back in April, 2016, both the city and the union made arguments before an arbitration panel regarding the legality of pension changes imposed by the city. Since then, we’ve been waiting for a ruling from the panel and hope they will send down their decision soon. We’ve presented to the city what we believe is a fair and equitable proposal that will bring closure to this dispute; one that we’re confident ATU 615 members are willing to accept. 1) If the ruling favours the city, ATU 615 will accept the arbitrator’s decision and sign the city’s offer. 2) If, however, the ruling favours the union, then we expect the city to sign the union’s agreement. Then why don’t we have deal yet? If the city can resolve this four year dispute by simply adhering to the legal decision of the arbitration panel, then why the deadlock? While there is no way of knowing with any certainty which way the panel will rule, it could very well be that the city doesn’t feel confident that the arbitration decision will be in their favour. Their recent push for us to sign their deal indicates an urgency on their part to get us to accept their offer before the ruling takes place. A ruling in favour of the union would be an embarrassment the city most likely wishes to avoid. What you can do to help end this stalemate. 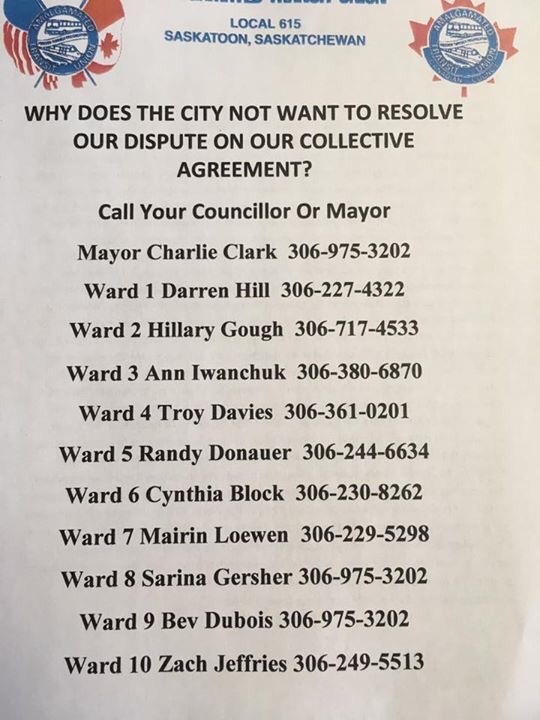 3) Call Mayor Charlie Clark or your city councillor and tell them that you are tired of this labour dispute. 4) Ask them to separate the pension issue from rest of the contract. We suggested this to the city, but they rejected the idea and insist that we accept their offer as a package deal. Ask them to reconsider. Let’s table pension discussions for when a new round of contact negotiations begin in 2017. 5) Demand a change in the way the negotiations are handled in order to quickly bring this dispute to a an end. Mayor Clark made ‘change’ the thrust of his election campaign. Now that he’s been elected, it’s time to claim that change and hold him to his word. With your support, we can resolve this issue once and for all. Please join us in our efforts for a fair and equitable agreement and help us restore fast, courteous and dependable bus service. Thank you for your time and patience. Your support is greatly appreciated. November 16th 2016 The Nomination Meeting for Atu Local 615 Elections Was HeldThis Is The Final List. WHY DOES THE CITY NOT WANT TO RESOLVE OUR DISPUTE ON OUR COLLECTIVE AGREEMENT? The city released their version on Facts on Transit Negotiations. I have attached a copy of their document for your ability to reference their statements. 1. If the transit union accepts the City’s deal is there back pay? Both our proposal and the cities indicate that back pay is payable. 2. Will I get this back pay all at once? Our proposal is that any member that worked any part of the timeframe from Jan. 1 ,2013 to current is entitled to back pay and it would be paid all at once. 3. The city decided not to pay the workers for the last two weeks of the illegal lockout. That is correct. The matter is before the courts and a decision is expected soon on whether the current ruling from the labor board remains intact or whether the courts will order a new labor board hearing on the matter. 4. Can the city force a vote on this offer? The city has stated that they themselves cannot. The minister or the employees may require a vote. Our membership has spoken to this issue at special meetings indicating by over 90% that they are not wanting to vote on the offer that included signing the employers pension agreement in principle under their terms. 5. I have heard the city is making wholesale changes to the pension plan. Does this mean I am going to lose my pension? Under the city proposal they are shifting liabilities and risk from the city to the members. There are two changes that enable them to transfer this risk. It is because of the language that allows the city to cap their contributions, and also a dispute resolution clause that simply states in the event the parties are unable to agree on plan changes, then a third party would determine which future service benefits would be cut, to ensure the plan could be supported within 9% funding from both parties. This potential cutting of future service benefits would also include any special payments the city would normally be required to make. Make no mistake. This is an extreme design change from what we have had in place since 1964. The city is saying don’t worry about this wording. We will still continue to bargain, if and when we get to this point. We do know that we will continue to bargain, but all they simply will be telling the group of us is that we signed this deal and have agreed to all the terms and conditions. Hence the dispute resolution clause will be invoked and a third party will tell us what benefits to reduce, or potentially the members of the plan would pay more, and not necessarily would the city have to contribute more ,because their rates are capped. Our Agreement in principle states that in the event we get to the point that we agree changes are necessary in the future, then we will simply bargain these changes as we have done since 1964. We would not be subjected or confined to work within the 9% per side contribution rates and we would also not be legally responsible for any shortfalls within the pension plan. This is the wholesale change that means if the plan funding does not meet the target, then changes must be made by the members to work within the target. Hence this is still a defined benefit, without a guarantee that future service will never be reduced. If you believe the city will ever bargain more money into the plan beyond 9% then I have some oceanfront property in Saskatchewan for sale. The chief negotiator stated to us at the bargaining table that they will never put more than 9% into any city pension plan, and I believe him. Why do you think this pension language is so valuable to the city? 6. I have heard the pension plan will change and it will not be a defined benefit plan. Is That true? The plan will still be registered as a defined benefit plan. The wording and agreements contained within the agreement in principle effectively change the risk structure to the members and also force the plan to function as a target benefit plan. Technically it is a defined benefit without a guarantee. In Murray Totland’s own words he has publicly stated that ATU is wanting something better or different than what the other 8 unions have settled for. It is clear that what all members have had since 1964 is better than what he is offering ATU members today. 7. In a media release, titled City remains firm after ATU executive pulls away from promises city-remains-firm the city states Quote (Unfortunately, the ATU executive retrenched its position on the pension changes and now says it will not accept the pension changes or the future sustainability plan for the pension) First off, ATU 615 has not pulled away from any promises. The city is attempting to discredit the current executive by suggesting we have somehow altered our position. Quite some time ago, discussions during bargaining took place about setting aside the pension issue and living to fight that battle another day, because the changes have already been imposed and there is no further sense of urgency in relation to the pension. Based on what ATU believed to be a general consensus that we could conceivably agree to settling all other issues, that the pension could be dealt with in the future, we continued bargaining the remaining outstanding issues. Upon resuming negotiations, the next day, we were informed that the city has retrenched their position and stated that we were going to sign their pension proposal once again. To insinuate that our executive has pulled away from promises is in gentle terms inaccurate. Nonetheless, I want you to know what our proposal given to the city on Tuesday November 8, 2016. atu-offer-for-settlement This proposal was what we believed to be way of resolving our outstanding issue of pension changes fairly and in the best interests of our members, the transit users, citizens of Saskatoon, Eight other unions and associations, and the political leaders of Saskatoon responsible for making decisions in the best interests of all citizens. ATU 615 and the city presented evidence in front of a 3 person arbitration panel in April of 2016, and are awaiting a decision from the board. The question the panel will be answering is a simple question in our eyes. The question is the city made changes to ATU 615 pension plan without consent through the bargaining process. The answer we are all awaiting is whether our language in the collective agreement together with all the evidence presented by both the city and ourselves at the hearing, supports our position or the cities. ATU is stating that the city did not have the legal authority to make the changes without our consent, and the city has argued that they were legally entitled to impose those changes without our consent. All parties are eventually going to receive the decision, anywhere from potentially tomorrow onwards in the near future I would expect. What our proposal that we gave to the city achieves is it allows both parties to rely on that decision to settle this disagreement. In the event ATU loses the arbitration, we agree to sign the cities proposed pension language in their agreement in principle. See appendix B atu-offer-for-settlement In the event the arbitration rules in the unions favor, then the city will sign our version of the agreement in principle. See appendix A atu-offer-for-settlement. Both pension agreement in principles state that all the changes made to the plan and registered would not change. Even though we could and have the ability to challenge the necessity of the changes, we could agree under this proposal that the changes to the plan would be agreeable to our members, identical to what the other group of 8 are currently agreed to. The difference between our wording in our agreement in principle and the city’s wording is the capping of rate and dispute resolution wording disappears, and in place our wording states that any further changes to the plan will be negotiated. This wording change is what this whole dispute is centered around. It is our opinion that a fair way of resolving this dispute is to simply allow the third party decision to determine which agreement in principle is accepted and settle this contract. Neither party is limited in the future from any legal appeals of the arbitration decision, and neither the city or the union is prevented from putting forth any bargaining language in future negotiations. In our eyes, a completely neutral third party will resolve this and all parties win. It is obvious that the city is not confident they are going to win this decision, otherwise they would have accepted this agreement. What I don’t understand is why the city decision makers would not accept this as a fair way of settling this agreement, as the term of this agreement runs out in a month and a half, and there are no urgent financial implications for the city. Instead what they continue to do is hold our members back pay as leverage to continue to try and force these pension changes on us. They are also now attempting to turn our members and the citizens against us for refusing to work overtime, once again knowing transit users may be impacted. This treatment of its workers and the citizens lies solely in the hands of city council. It is time that this be resolved before more citizens are impacted. What are you afraid of city council? Do the right thing and accept our proposal by simply allowing a third party to decide and live with the decision. ATU IS PREPARED TO DO JUST THAT. Your executive has served notice to the employer that in the event an agreement that we can recommend acceptance to is not achieved then we will engage in a work to rule and ban on overtime directive to our membership that would start at 12:01 am Saturday November 12, 2016. The employer has since given us an offer wanting us to simply sign their pension proposal and then await the arbitration ruling. We proposed that if we lose our pension arbitration ruling then we could accept their proposal. But in the event we win the arbitration ruling ,then they would sign our pension proposal. It is obvious that they are not confident they are going to win the arbitration case because they have failed to accept our proposal. Hence your directive to the executive is to engage in job action . The intent of this directive is to provide the employer further incentive to resolve our outstanding collective bargaining agreement. We believe that there is no alternative other than to act now to send a clear message that we are united and strong in our quest for a fair collective agreement. If you have any questions, please contact a Union Steward or the Office for clarification. 1. Members shall not work overtime unless ordered to in an emergency situation. Members ordered to work overtime may write a note saying that they are overly tired and that safety is a concern. Give a copy to your supervisor and keep a copy for yourself. 2. All members are to familiarize themselves with all rules and regulations. 3. Drive defensively. Observe all traffic signs and signals. Do not drive faster than the maximum posted speed limit or as road conditions permit. 5. Before moving a bus in the garage or relieving on the road, do a walk around and check for defects, damage etc. If in garage call dispatch and have the bus defects attended to. 6. You have the right to refuse unsafe work. 7. Get plenty of rest to help reduce stress. 8. Exercise good judgment, common sense, immense patience; be civil and forward any concerns to an A.T.U. Representative. 1. Safety must never be sacrificed for schedule. 2. Report to dispatch at report time, not early. 4. Familiarize yourself with the applicable Operations rulebook and bulletins. 5. Spare board Operators; check your work against sign-up sheets. 6. If you are required to back up a bus and no one is around, call control and request assistance from a supervisor. 7. Change over defective buses. If ordered to carry on advise control of the safety breach. 8. Do not volunteer to do change overs. Should a supervisor order you to do one confirm that it is an emergency and book the overtime. 9. Call control to advise them if you are more than six minutes late. 10. Move in and out of service stops smoothly and carefully. 11. Make good use of your Transit Route maps. 12. When aiding customers with concerns or dealing with other driving distractions (conversing with control) pull bus over to a safe location. 13. Use caution approaching crowded bus stops. 14. Position your bus within 6 inches from the curb. 15. Ensure vehicle is fully stopped before opening doors. 16. Keep the steps clear and clean. Avoid congestion in the doorways. 17. Do not load passengers past designated line. 18. Give other motorists plenty of advance warning of your intentions. 19. Allow all passengers to position themselves safely in the bus before proceeding. 20. During all phases of operation between stops make all manoeuvres gradually and safely. 21. Check mirrors to ensure patrons are clear of the bus before proceeding. 22. Do an out of service bus check at your last stop and arrive at the fare box at your scheduled time. 23. Spareboard Operators check your running boards for discrepancies (e.g. report and clear times, travel times). 24. Operators should not accept a shift with a spread time or total of more than 13 hours. Call a Union Official if you receive such a shift. 25. To insure the safety of your co-workers and the public please follow all rules, procedures and operating orders. 1. Walk around all vehicles before moving them. 2. Any safety defects found on vehicle – document and report to supervisor. 3. If necessary to back a vehicle up make sure someone is there to assist. 4. Use 2 persons when lifting cabs, springs etc. Do not risk injury. 5. Do not volunteer to help other employees from different areas perform their jobs. Request supervisor to assign assistance. 6. Do not combine trips for parts. 7. Use safety stands under all vehicles. 8. When doing change off use defensive driving, follow rules of the road. 9. Cleaning crew, as always, `do a thorough job. 10. Do a proper vehicle check before leaving garage for change off. 11. Use exhausts hook ups. 12. If bus is mechanically unsafe (brakes, steering etc.) to drive call for a tow truck. 13. Follow WHMIS guidelines at all times. 14. Personal protective equipment should be obtained and used. 15. Ask supervisor to remove worn/damaged (unsafe) tools from service. Check equipment before you use it. Thorough reporting procedures to be used at all times. Take your scheduled breaks (coffee, lunch etc.). Leave work on time. If management does not schedule enough time for you to finish it is not your responsibility. Do not volunteer for additional shifts. In addition to the above, common sense must prevail. As always we suggest that you follow these rules each and every day of the year. This will make for a safer and more rewarding work place. Do not break any work place rules as management will be watching you. Thank you for your co-operation as we struggle to negotiate a better work place for you. There is great strength in unity.